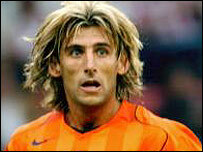 Spanish midfielder Miguel Angel Angulo will not be joining Arsenal after agreeing a new deal with Valencia. Gunners manager Arsene Wenger had agreed a £3.5m fee for the 27-year-old and the player looked set to finalise a move to London on Tuesday. He even underwent the first part of his medical with the Premiership club, according to reports in Spain. But he had a last-minute change of heart and is expected to sign a contract extension at Valencia. According to the player's agent, he did not have "sufficient strength for a change of lifestyle". Jose Luis Tamargo said: "It's difficult to explain why he has taken such a drastic decision and we are sorry for Arsenal. "Fear overcame him that he could not fit in at Arsenal nor with the English lifestyle. "He felt that this could affect his performance on the pitch. He had doubts before signing the contract and believed the best thing to do was not to commit to something that you are not completely convinced about." Angulo has one year left on his current contract at Valencia and the Spanish club are hopeful he will now stay at the club. Valencia president Jaime Orti said: "The player passed the first part of a medical but it looks as though he has decided to come back. "We will sit down and talk with him about the present and future on Tuesday. We don't know the exact reasons for his decision but we will welcome him back and all hope he will stay with Valencia." And Valencia boss Claudio Ranieri added: "It's like the return of the prodigal son. "I'm very happy because he's a very professional player and is important to Valencia. He was unsure about the move and I said that he should go with his heart and it appears as though his heart told him he should stay." Previously Angulo said he had rejected a bid from Chelsea to join Arsenal and professed his admiration for Wenger. He said: "He is a great coach who employs modern systems in English football. He is one of the best coaches in Europe."